Cliffe Castle Park in Keighley is being restored with funds from the Heritage Lottery Fund. 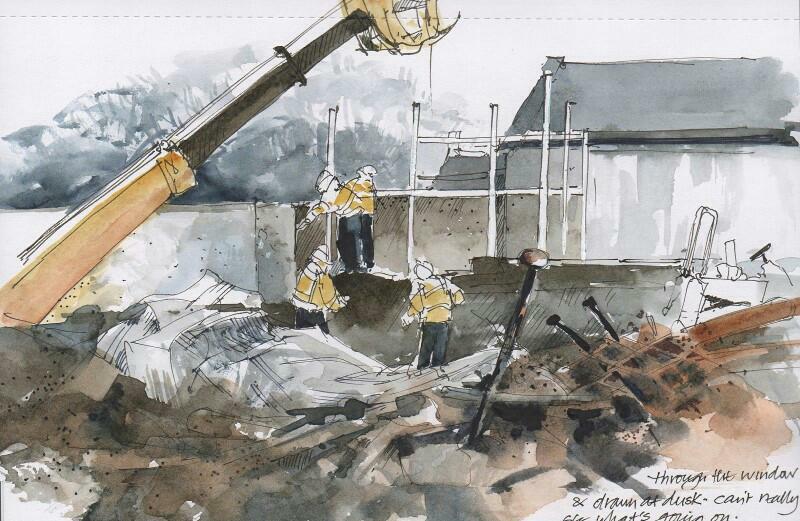 Work started on site back in June and I’m following progress and sketching whenever I can. Many of the plants that were in the old glasshouses were removed before the demolition and stored for safety, so some of these cactii and succulents will find their way back into the new planting schemes. But in the meantime, behind the scenes, a lot of work is going on to plan and devise what to plant and how best to arrange it. Rooteries are simpler, more natural, and less contrived. Last week Dan Palmer the Heritage Parks Officer put together a collection of roots and the odd bit of stump collected from uprooted bushes from the park hedges and planted a few ferns and other plants as an example of what might be done. I loved it – I think I even recognised the root from drawing it where it was lying outside during the previous week – and I just had to do a sketch of this sample Rootery. The planting schemes for the whole park still have to be finalised and it will exciting to follow; it has taken an enormous amount of research into the history of the original gardens and to source specimens of just the right kind. Only this week there was exciting news about rhododendrons…… but more about this another time!